The National Antimicrobial Resistance and Stewardship Forum will be held at the University of Melbourne in Melbourne, Victoria, on Thursday, 1 November, and Friday, 2 November, 2018. 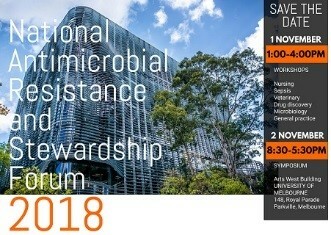 This forum, organised jointly by a number of Australian clinical and research groups working on AMR and AMS, will offer a dynamic program covering all facets of the response to antimicrobial resistance, including clinical infectious diseases and antimicrobial stewardship, translational science, new drug development, veterinary and agricultural medicine, and government, media and policy responses. As part of the forum, a series of CPD-accredited workshops focusing on different professional groups will be offered on Thursday, 1 November. The 2018 forum is being hosted by the National Centre for Antimicrobial Stewardship and Safer Care Victoria. Registrations open in June.